Pancit (alternate spelling “pansit”) is a well-known Filipino noodle dish that comes in many variations and is very versatile. 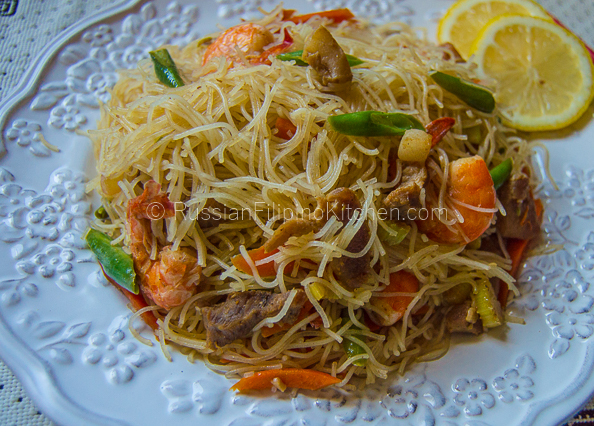 There is no celebration or special gatherings among Filipinos without pancit on the menu. Borrowed from the Chinese tradition, we believe that eating pancit on our birthday brings good luck and gives us a long life. Regardless of this superstition, I personally believe pancit is one of the best Filipino foods out there, and I literally can eat it every single day. At one point in my life when I was on a strict diet to lose weight fast, I skipped the rice entirely but had a single serving of pancit once a day as my source of carbs. For today’s recipe, I am sharing with you all an easy pancit bihon recipe that is quick to make and delicious. It is a little bit different from the pancit canton recipe I shared in the past only in the type of noodles used, otherwise the procedure and ingredients are almost the same. Pancit canton guisado uses dry yellow noodles made from wheat flour. Pancit bihon is also a kind of dry noodles, only white and made from rice flour and sometimes cornstarch. The strands of bihon noodles are thinner than pancit canton. 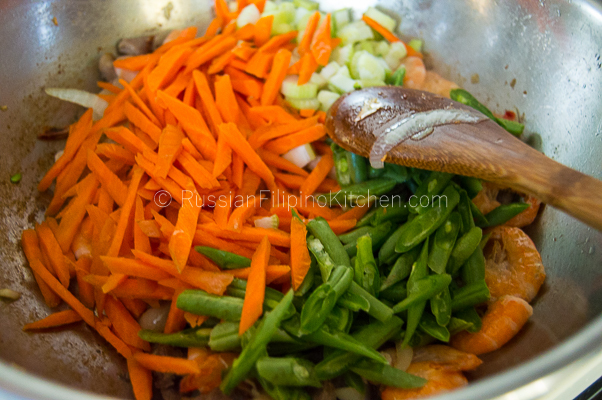 Many cooks have different takes on how they make their pancit bihon guisado. It all depends on preference and taste. For meat, you can use pork, chicken, or shrimps alone. Or you can put them all together for a more flavorful dish. You can also add any vegetables you like. Just adjust the seasonings to balance the taste. I like my pancit canton with just one or two veggies: as simple as carrots and green beans. But occasionally I also add celery and cabbage when I have them in the fridge. 1. Heat wok or skillet on medium heat. Add pork belly and sprinkle with ¼ teaspoon salt. Sauté until oil comes out and meat has browned, about 5 minutes. 2. Throw in garlic and onions until garlic has browned a little and onions become translucent, about a minute. 3. Add the shrimps and sauté for another minute until color changes to bright orange. 4. Throw in the rest of the veggies and mix. 5. Season with ground black pepper and soy sauce. Keep sautéing until vegetables are cooked, about 3-5 minutes. 6. Transfer sautéed meat and vegetables into a plate or bowl and set aside. 7. In the same wok or skillet, pour chicken broth and bring to a boil. 8. Lower the heat and add the dry bihon noodles. Use the spaghetti spoon to break the noodles apart while mixing them with the broth. Keep mixing until most of the liquid has dried up. 9. Add sautéed veggies back into the wok/skillet and mix thoroughly for another minute or so until well-combined. 10. Serve immediately. I love this! Will definitely give this a try! did you peel the shrimp? Hello! For this recipe, I left the peel intact as I find it adds flavor. But I also use deveined and peeled shrimps when I have them. It’s just a matter of preference really. I am basically dribbling over my keyboard. Looks beautiful. Your recipe is great. I cook my pancit almost the same way you do. I just add in a little bit of oyster sauce to add flavor and color to the noodles.